To Cite: Abolhasani Foroughi A, Nowroozzadeh M H, Khorsand A, Nazeri M, Yasemi M, et al. Abnormal High Signal Intensity Discovered in Eye Lenses in Routine Brain MRI; Correlation with Ophthalmologist Examination, Iran J Radiol. 2018 ; 15(1):e61842. doi: 10.5812/iranjradiol.61842. Patients and Methods: This study was performed on patients who were referred to Shahid Faghihi hospital with a known disease for brain MRI. Patients were classified in two groups of case and controls. Cases were 44 eyes with abnormal signal of the lens and controls were 88 eyes with normal signal intensity of the lens. All patients underwent an ophthalmological examination and the presence of cataract and intraocular lens (IOL) was assessed in these patients. Average lens signal, average muscle signal, average fat signal, lens to muscle signal ratio, and average lens signal to average fat signal ratio were recorded. Results: The mean of the average lens signal in the case group was significantly higher than controls (370 versus 161, respectively) (P value < 0.0001). Sixteen (36.4%) out of 44 eyes in the case group had cataract, but 48 (54.5%) of 88 eyes in the control group had cataract (P value = 0.049). In the case group, 18.2% had IOL, and this was 6.8% in the controls (P value = 0.046). The mean of the average lens signal in eyes with cataract was 218.5 and in normal eyes, it was 249.1 (P value = 0.36). In eyes with IOL, the mean of the average lens signal was 347.5 and in normal eyes, this was 223.1 (P value = 0.036). Conclusion: Cataract in eyes with abnormal lens signal was significantly lower than eyes with normal lens average signal. The lens signal in eyes with cataract was similar to eyes without cataract. So, average lens signal in brain MRI does not lead to early detection of cataract. Magnetic Resonance Imaging (MRI) is based on the magnetic resonance properties of nuclear particles (specifically hydrogen) and its interaction with both a large external magnetic field and radiofrequency waves to produce highly detailed images of the human body. The pathology is often distinguished by the intensity of normal moods (1, 2). MRI is a unique diagnostic modality because of its the noninvasive characteristics plus inherent high resolution and various chemical contrasts (2). MRI is used at a variety of developmental stages in ophthalmology. The common uses in ophthalmology are clinical structural assessment for neuro-ophthalmology and evaluation of space occupying lesions (2, 3). Cataract is a disease that causes visual disorders resulting from lens opacity. This disease commonly occurs among the elderly when the lens slowly hardens and becomes opaque (4). It is reported that the incidence rate of cataracts in people over 50, 60, and 70 years is 60%, 80%, and 90%, respectively (4-7). Worldwide, millions of people undergo cataract and refractive surgery with intraocular lens (IOL) implantation. The incidence of cataract surgery with IOL implantation as the most commonly performed surgery is still increasing (8, 9). A number of studies have reported using conventional MRI in the eye. Lizak et al. reported that regular and enhanced MRI detected statistically significant differences between normal and cataracts lenses (10). The results of a study conducted by Dobretsov et al. on rat lenses demonstrated that MRI as an effective method can be positively applied to the study of fine structure and physical properties of such small biological objects (11). The results of a study performed by Van Rijn et al. demonstrated that IOLs are compatible with MRI at a magnetic field strength of 7 Tesla (12). Sheppard et al. after evaluation of three-dimensional MRI of the phakic crystalline lens during accommodation, reported that mean crystalline lens thickness increased during accommodation (13). MRI is a way to systematically analyze many details on MR images and integrate these into patterns per disease (14, 15). The assessment of signal intensity in lens is easy and it may be used as diagnostic tool to find clinical relevance in ophthalmology. There are limited data about the diagnostic role of brain MRI in ophthalmology. To our knowledge, there is no information about the early diagnostic use of brain MRI in invisible cataract and this is the first study that was designed and preformed to evaluate the possible use of abnormal signal intensity in the lens in brain MRI in the early detection of invisible cataract. The objective of the presentstudy was to evaluate the relationship between signal intensityin the lens in brain MRI and cataract and IOL. This study was performed between April 2015, and March 2016, and it received approval of the institutional review board from Shiraz University of Medical Sciences. In the present study, patients who were referred to Shahid Faghihi hospital with a known disease for brain MRI were enrolled and their MRI scans were included in the study if they were older than 40 years and did not have a history of non-lens eye diseases, trauma, or ophthalmic surgery. All enrolled patients underwent brain MRI scans if they were eligible for MRI and did not have a permanent heart pacemaker, aneurysm clips or cochlear implants. In addition, patients were informed about the objectives of the study and their MRI scans were assessed after obtained verbal individual consent. The MRI scans were evaluated by consensus of two investigators and patients were stated in two groups of case and controls. 44 eyes with abnormal signal intensity of the lens were selected as cases and with the case-to-control ratio of 1:2. Eighty eight eyes with normal signal intensity of the lens were selected as controls. All patients in the case and control groups underwent an ophthalmological examination after written informed consent was given and the presence of cataract and IOL was assessed in these patients. The presence of cataract was defined as the existence of any cataract, pseudophakia or aphakia. The ophthalmologist was blinded to the state of the patients in the studied groups. Collected data included age, gender, average lens signal, average muscle signal, average fat signal, average lens signal to average muscle signal ratio, average lens signal to average fat signal ratio, presence and degree of cataract, and presence and degree of IOL. Average lens signal to average muscle signal ratio is calculated by dividing average lens signal to average muscle signal and average lens signal to average fat signal ratio is calculated by dividing average lens signal to average fat signal. Data were managed and analyzed by SPSS software for Windows, Version 23.0. (IBM Corp., IBM SPSS Statistics for Windows,Armonk, NY). Descriptive data were reported as mean ± standard deviation (SD) or number (percent) as appropriate. Continuous measured variables including age, average lens signal, average muscle signal, average fat signal, average lens signal to average muscle signal ratio, average lens signal to average fat signal ratio were compared between groups using independent sample t-test. Gender, the presence of cataract, and IOL were compared between cases and controls using Pearson’s chi-squared test. The relationship between average lens signal and age was assessed by Pearson coefficient and between signal intensity and the degree of cataract was assessed by Spearman coefficient. The agreement between the two investigators was assessed by calculating kappa coefficient. Alpha was set at 5% and all probability tests used were two-tailed. aData are mean ± SD, or number (%). Case group included eyes with abnormal signal in brain MRI and controls included eyes with normal signal in brain MRI. bP values calculated by Independent sample t-test. cP values calculated by Chi square test. aData are mean ± SD. In this study, 56 eyes with abnormal signals in brain MRI were reviewed, 12 eyes were not eligible or refused informed consent and 44 eyes were selected as the case group. Then, 102 eyes with normal signals in brain MRI were reviewed, 14 eyes were not eligible and 88 eyes were selected as the control group. Table 1 shows findings of studied variables between case and control groups. The mean age of the cases was 44.3 ± 16 years and in the controls it was 49.4 ± 15.4 years (P value = 0.21). Of subjects in the case group, 31.8% were male and 68.2% were female. Among controls, 45.5% were male, and 54.5% were female (P value = 0.23). The mean of lens average signal in the case group was significantly higher than controls (370 versus 161, respectively; P value < 0.0001). The means of average muscle signal and average fat signal between case and control groups were similar and no statistical significance was noted between the two groups (P value > 0.05). There is a significant different between groups regarding the ratio between average lens signal to average muscle signal. Cases show higher ratio compared to controls (1.4 versus 0.57, respectively; P value < 0.0001). The ratio of muscle in the case group was significantly higher than controls (0.49 versus 0.24, respectively; P value < 0.0001). 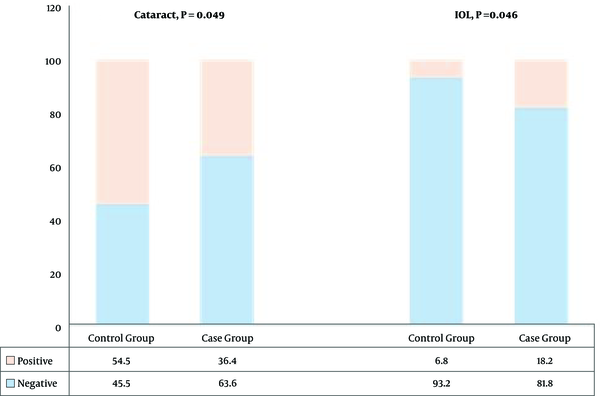 The status of cataract between case and control groups was significantly different, of 44 studied eyes in the case group, 16 eyes (36.4%) had cataract, but among 88 studied eyes in the control group, 48 eyes (54.5%) had cataract (P value = 0.049). Also, IOL was significantly different between groups. In the case group, IOL was significantly more observed than in the control groups (18.2% of cases versus 6.8% of controls, P value = 0.046). Among cases with abnormal signal in MRI, the frequency of cataract was lower and the frequency of IOL was higher than the control group with normal signal (Figure 1). Comparison of average lens signal and signal intensity in regard to the presence of cataract or IOL is shown in Table 2. The mean of average lens signal in eyes with cataract was 218.5 and in normal eyes the figure was 249.1, which was not statistically significant (P value = 0.36). In regard to the presence of IOL, the mean of average lens signal was statistically significant. Among 14 eyes with IOL, mean of average lens signal was 347.5 and in normal eyes, this was 223.1 (P value = 0.036). There is no significant relationship between the presence of cataract and signal intensity, and most of the eyes with or without cataract had low signal intensity (P value = 0.08). There is a significant relationship between the presence of IOL and signal intensity, whereas, the majority of eyes without IOL had low signal intensity but half of the eyes with IOL had high signal intensity (P value < 0.0001). Table 3 shows the relationship between average lens signal and age, and signal intensity and the degree of cataract. As shown, there is a negative non-significant relationship between average lens signal and age (Pearson coefficient, -0.162; P value = 0.2). Also, a negative relationship was observed between signal intensity and the degree of cataract, which was not statistically significant (Spearman coefficient, -0.154; P value = 0.08). Kappa coefficient between observers was calculated. Both of the observers reported cataract in 86 eyes, and they also reported 30 eyes without cataract. Kappa coefficient in this study was 0.706. In recent years, ophthalmology has provided an opportunity for many varied approaches to imaging of the eye in a clinical setting. MRI as a developed technique has the potential to provide clinically relevant information, particularly in cases where it is not possible to optically obtain the information needed (2). The objective of the present study was to evaluate the relationship between signal intensity in the lens in brain MRI and cataract and IOL. The prevalence of cataract in the studied population was 48.5%. Our findings demonstrated that cataract in the group with abnormal average lens signal was significantly lower than the group with normal average lens signal. In addition, IOL in cases was significantly more than controls. Average lens signal in eyes with cataract was similar to eyes without cataract, but in eyes with IOL, it was significantly higher than eyes without IOL. The numerous methods were reported in previous researches to study the internal lens structure, metabolite distribution, and transport of water and solutes inside the lens. MRI technique as a non-invasive method has the main role. Some studies reported the successful use of MRI for visualization of the human eye structure in vivo (10, 16-19). Regular and enhanced MRI detected differences between normal and cataract lenses in Lizak and colleagues study (10). Other studies show the successful use of MRI for measurement of protein distribution inside the lens and the spatial gradient of refractive index (17, 18, 20-23). Also, some other studies demonstrated that MRI could be used as an effective method to diffusivity mapping of the lens (24-26). On the other hand, the positive use of MRI in real-time measurements of water transport in the lens has been reported by previous studies (27-29). Sheppard et al. showed the successful use of MRI for the measurement of mean crystalline lens thickness during accommodation (13). Van Rijn et al. reported that IOLs are compatible with MRI (12). In an animal study, MRI showed to be an effective method that applied to the study of fine structure and physical properties of such small biological objects such as rat lenses (11). In the present study, the use of lens signal has been assessed in detecting cataract in brain MRI scans, our findings show that average lens signal was similar in eyes with or without cataract, but in eyes with normal lens signal, the prevalence of cataract was more than eyes with abnormal lens signal. These findings did not support the findings in reported studies that show the successful use of MRI. However, there are some differences between our study and previous studies. We assessed the signal intensity of the lenses whereas other studies assessed different methods. In addition, differences in the studied population can be noted as the other cause of verity of findings. In conclusion, the results of the present study demonstrated that cataract in eyes with abnormal average lens signal was significantly lower than eyes with normal average lens signal. The average lens signal in eyes with cataract was similar to eyes without cataract. Our findings did not show positive use of average lens signal in brain MRI for the early detection of cataract. The finding of this study should be interpreted with caution because there was a negative non-significant relationship between lens signal and age. This means that lens signal decreased in older age; whereas, cataract is known as an age dependent disease. These can affect our results, although we selected controls in the same age group as cases. Since cataract has emerged as a public concern and the cost burden for cataract surgery has increased with an aging population, finding new methods to detect early cataract can be helpful for public health. Therefore, further research is warranted in order to establish the possible successful use of lens signal in brain MRI to detect cataract. 1. Cheng HM, Yeh LI, Barnett P, Miglior S, Eagon JC, Gonzalez G, et al. Proton magnetic resonance imaging of the ocular lens. Exp Eye Res. 1987;45(6):875-82. [PubMed: 3428403]. 2. Townsend KA, Wollstein G, Schuman JS. Clinical application of MRI in ophthalmology. NMR Biomed. 2008;21(9):997-1002. doi: 10.1002/nbm.1247. [PubMed: 18384176]. 3. Ahn CB, Anderson JA, Juh SC, Kim I, Garner WH, Cho ZH. Nuclear magnetic resonance microscopic ocular imaging for the detection of early-stage cataract. Invest Ophthalmol Vis Sci. 1989;30(7):1612-7. [PubMed: 2745002]. 4. Horng CT, Sun HY, Liu HJ, Lue JH, Yeh SM. Predicting the Incidence of Human Cataract through Retinal Imaging Technology. Int J Environ Res Public Health. 2015;12(11):14800-10. doi: 10.3390/ijerph121114800. [PubMed: 26610533]. 5. Dorairaj S, Vatsala V, Vijaya Kumar J, Kesavai R, Sucheethra DS, Vidyasree S. Morphometric and histological study of human cataract lens. J Anat Soc India. 2002;51(1):14-7. 6. Gilliland KO, Johnsen S, Metlapally S, Costello MJ, Ramamurthy B, Krishna PV, et al. Mie light scattering calculations for an Indian age-related nuclear cataract with a high density of multilamellar bodies. Mol Vis. 2008;14:572-82. [PubMed: 18385793]. 7. Williamson TH, Strong NP, Sparrow J, Aggarwal RK, Harrad R. Contrast sensitivity and glare in cataract using the Pelli-Robson chart. Br J Ophthalmol. 1992;76(12):719-22. [PubMed: 1486072]. 8. Behndig A, Montan P, Stenevi U, Kugelberg M, Lundstrom M. One million cataract surgeries: Swedish National Cataract Register 1992-2009. J Cataract Refract Surg. 2011;37(8):1539-45. doi: 10.1016/j.jcrs.2011.05.021. [PubMed: 21782099]. 9. Erie JC, Baratz KH, Hodge DO, Schleck CD, Burke JP. Incidence of cataract surgery from 1980 through 2004: 25-year population-based study. J Cataract Refract Surg. 2007;33(7):1273-7. doi: 10.1016/j.jcrs.2007.03.053. [PubMed: 17586386]. 10. Lizak MJ, Datiles MB, Aletras AH, Kador PF, Balaban RS. MRI of the human eye using magnetization transfer contrast enhancement. Invest Ophthalmol Vis Sci. 2000;41(12):3878-81. [PubMed: 11053289]. 11. Dobretsov EA, Snytnikova OA, Koptyug IV, Kaptein R, Tsentalovich YP. Magnetic resonance imaging (MRI) study of the water content and transport in rat lenses. Exp Eye Res. 2013;113:162-71. doi: 10.1016/j.exer.2013.06.008. [PubMed: 23791967]. 12. van Rijn GA, Mourik JE, Teeuwisse WM, Luyten GP, Webb AG. Magnetic resonance compatibility of intraocular lenses measured at 7 Tesla. Invest Ophthalmol Vis Sci. 2012;53(7):3449-53. doi: 10.1167/iovs.12-9610. [PubMed: 22538424]. 13. Sheppard AL, Evans CJ, Singh KD, Wolffsohn JS, Dunne MC, Davies LN. Three-dimensional magnetic resonance imaging of the phakic crystalline lens during accommodation. Invest Ophthalmol Vis Sci. 2011;52(6):3689-97. doi: 10.1167/iovs.10-6805. [PubMed: 21296812]. 14. van der Knaap MS, Breiter SN, Naidu S, Hart AA, Valk J. Defining and categorizing leukoencephalopathies of unknown origin: MR imaging approach. Radiology. 1999;213(1):121-33. doi: 10.1148/radiology.213.1.r99se01121. [PubMed: 10540652]. 15. van der Knaap MS, Valk J, de Neeling N, Nauta JJ. Pattern recognition in magnetic resonance imaging of white matter disorders in children and young adults. Neuroradiol. 1991;3:478-93. 16. Patz S, Bert RJ, Frederick E, Freddo TF. T(1) and T(2) measurements of the fine structures of the in vivo and enucleated human eye. J Magn Reson Imaging. 2007;26(3):510-8. doi: 10.1002/jmri.21017. [PubMed: 17729342]. 17. Jones CE, Atchison DA, Pope JM. Changes in lens dimensions and refractive index with age and accommodation. Optom Vis Sci. 2007;84(10):990-5. doi: 10.1097/OPX.0b013e318157c6b5. [PubMed: 18049365]. 18. Kasthurirangan S, Markwell EL, Atchison DA, Pope JM. In vivo study of changes in refractive index distribution in the human crystalline lens with age and accommodation. Invest Ophthalmol Vis Sci. 2008;49(6):2531-40. doi: 10.1167/iovs.07-1443. [PubMed: 18408189]. 19. Kasthurirangan S, Markwell EL, Atchison DA, Pope JM. MRI study of the changes in crystalline lens shape with accommodation and aging in humans. J Vis. 2011;11(3). doi: 10.1167/11.3.19. [PubMed: 21441300]. 20. Garner LF, Smith G, Yao S, Augusteyn RC. Gradient refractive index of the crystalline lens of the Black Oreo Dory (Allocyttus Niger): comparison of magnetic resonance imaging (MRI) and laser ray-trace methods. Vision Res. 2001;41(8):973-9. [PubMed: 11301072]. 21. Moffat BA, Pope JM. The interpretation of multi-exponential water proton transverse relaxation in the human and porcine eye lens. Magn Reson Imaging. 2002;20(1):83-93. [PubMed: 11973033]. 22. Jones CE, Pope JM. Measuring optical properties of an eye lens using magnetic resonance imaging. Magn Reson Imaging. 2004;22(2):211-20. doi: 10.1016/j.mri.2003.07.005. [PubMed: 15010113]. 23. Jones CE, Atchison DA, Meder R, Pope JM. Refractive index distribution and optical properties of the isolated human lens measured using magnetic resonance imaging (MRI). Vision Res. 2005;45(18):2352-66. doi: 10.1016/j.visres.2005.03.008. [PubMed: 15979462]. 24. Wu JC, Wong EC, Arrindell EL, Simons KB, Jesmanowicz A, Hyde JS. In vivo determination of the anisotropic diffusion of water and the T1 and T2 times in the rabbit lens by high-resolution magnetic resonance imaging. Invest Ophthalmol Vis Sci. 1993;34(7):2151-8. [PubMed: 8505198]. 25. Moffat BA, Pope JM. Anisotropic water transport in the human eye lens studied by diffusion tensor NMR micro-imaging. Exp Eye Res. 2002;74(6):677-87. [PubMed: 12126942]. 26. Vaghefi E, Pontre B, Donaldson PJ, Hunter PJ, Jacobs MD. Visualization of transverse diffusion paths across fiber cells of the ocular lens by small animal MRI. Physiol Meas. 2009;30(10):1061-73. doi: 10.1088/0967-3334/30/10/007. [PubMed: 19738316]. 27. Vaghefi E, Pontre BP, Jacobs MD, Donaldson PJ. Visualizing ocular lens fluid dynamics using MRI: manipulation of steady state water content and water fluxes. Am J Physiol Regul Integr Comp Physiol. 2011;301(2):R335-42. doi: 10.1152/ajpregu.00173.2011. [PubMed: 21593426]. 28. Vaghefi E, Walker K, Pontre BP, Jacobs MD, Donaldson PJ. Magnetic resonance and confocal imaging of solute penetration into the lens reveals a zone of restricted extracellular space diffusion. Am J Physiol Regul Integr Comp Physiol. 2012;302(11):R1250-9. doi: 10.1152/ajpregu.00611.2011. [PubMed: 22496364]. 29. Moffat BA, Landman KA, Truscott RJ, Sweeney MH, Pope JM. Age-related changes in the kinetics of water transport in normal human lenses. Exp Eye Res. 1999;69(6):663-9. doi: 10.1006/exer.1999.0747. [PubMed: 10620395].